The Affordable Care Act is already playing a major role in slicing the national uninsured rate to its lowest point in recent history. A new analysis by the Urban Institute projects that the law will also help narrow the coverage gap between white people and minorities. Obamacare provisions expanding Medicaid and creating new health exchanges, among others, will help shrink the coverage gap between whites and Latinos by about 5 percentage points by 2016 while narrowing the gap between whites and Asian/Pacific Islanders by two points. The difference in coverage rates between whites and American/Alaskan natives would shrink by roughly two-and-a-half points and between whites and blacks by a point and a half. The ACA has been successful in expanding health care coverage, and the projections in the new report could add to calls for additional Medicaid expansion. They also show how stark state-by-state policy differences translate into a broader racial divide in coverage. “Everybody benefits, but some more than others,” the Urban Institute’s Lisa Clemans-Cope, a co-author of the report, said in a statement. Overall, the report estimates that the uninsured rate for whites will drop by 52 percent by 2016, compared to 39.2 percent for Latinos over that time period. 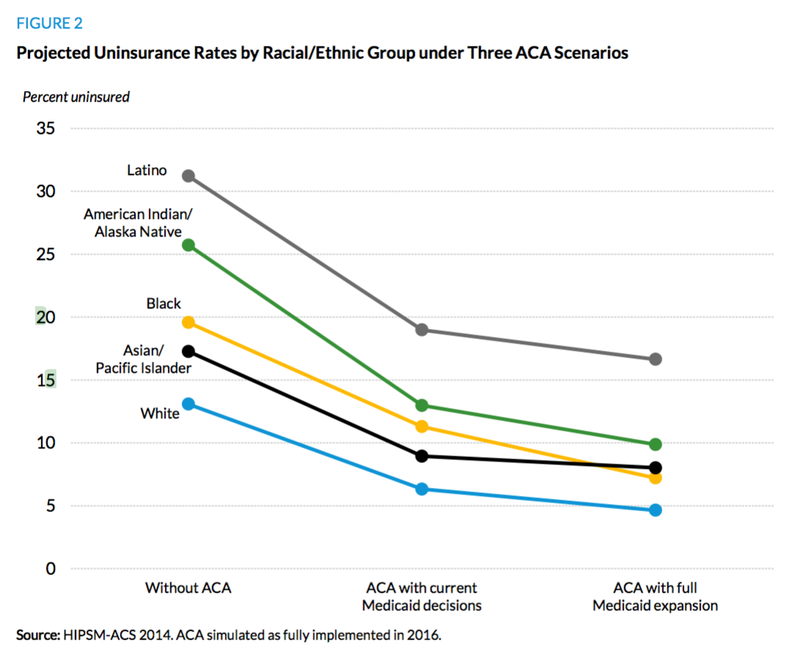 The remaining ethnic groups will see drops in their uninsured rates between that range. The researchers estimate that by 2016, more than 22.5 million people will likely have gained health coverage because of the law, with whites making up nearly half of those people, about 11.1 million, followed by Latinos with 6.6 million. For example, under the current structure—with 27 states and the District of Columbia participating in Medicaid expansion, the study estimates that the uninsured rate among blacks is projected to fall from 19.6 percent to 11.3 percent. If all states expanded their Medicaid programs, the uninsured rate would dive down to 7.2 percent, according to the study. Right now, researchers estimate that about 1.4 million adult blacks fall into the so-called Medicaid coverage gap, since they are uninsured, don’t qualify for traditional Medicaid, don’t live in a state that expanded Medicaid and wouldn’t be able to qualify for subsidies on the state or federal exchanges. The Urban Institute also found tribal groups like the— Eskimo, Cherokee, Sioux and Lumbee would also “experience dramatic gains” under full Medicaid expansion. Meanwhile, Latinos would likely not see as big of a drop under Medicaid expansion, the study noted, since undocumented immigrants cannot qualify for the program. The study points out that more than 16 percent of Latinos in the U.S. are undocumented immigrants. The projections about what might happen under full Medicaid expansion are likely to stay just that: projections. Republican governors in Tennessee, Wyoming and Utah are all moving toward expanding their Medicaid programs, but full nationwide expansion is doubtful anytime soon. Republican governors in states that have opted not to expand Medicaid coverage have defended their decisions by saying the change would not be financially sustainable for their states. Under the ACA, the federal government is responsible for 100 percent of the cost of expanding Medicaid for the first three years of the program, then it’s required to pick up 90 percent of the tab after that. Still, the governors in states that haven’t expanded say their budgets couldn’t handle the extra costs.